Things have been rather quiet on the Black Hood front lately. He hasn’t been torturing Betty, he hasn’t killed anyone else, and he hasn’t sent any more codes or threatening letters around. We can only wonder what exactly is going on with him and – thankfully – it all seems to come to a close this week. After an adorable Secret Santa exchange between the whole gang, Betty and Archie notice that their janitor, Mr. Svenson, is missing. Turns out he’s been gone for a few days and seems to be out with a cold. This doesn’t sit well with Betty and Archie, so they decide they should go check in on him to make sure he’s okay only to find he doesn’t seem to be home. It’s rather ominous and we can only assume that the Black Hood is responsible for his kidnap. Things are moved along when Betty gets a gift at home from another Secret Santa that turns out to be Mr. Svenson’s finger. Creepy! There’s an enclosed note with an accompanying phone call that tells Betty to find the original sin and maybe save Mr. Svenson’s life. This leads Betty and Archie on a chase around town where they talk to the nuns at Sisters of Quiet Mercy (which is where pregnant Polly was shipped off to) and it leads them to Cheryl’s grandmother, Nana Rose, who visited Mr. Svenson when he was a child. Betty and Archie ask Nana Rose about the murder of the man Mr. Svenson claimed killed his family. It turns out Nana Rose wasn’t there because no women were allowed, but Betty’s grandfather was there and they had buried him alive under the Devil’s Hand and there was a photo. It also turns out that Mr. Svenson came to realize he had identified and inadvertently killed an innocent man. Betty later identifies the photo Nana Rose mentioned and Betty and Archie race to Pickens Park to save Mr. Svenson, only he’s not there: the Black Hood buried an empty coffin. The reason why becomes apparent when he shows up with a gun and makes Archie get in the coffin and Betty cover him with dirt. Thankfully, Betty and Archie called the police on their way to the park, so the Black Hood is distracted by the approaching sirens enough for Betty to smack him with the shovel and get Archie out. They chase the Black Hood down the road and he almost jumps into the river before Archie shoots him with his own gun that he had dropped. Sheriff Keller gets there in time to check for a pulse (there isn’t one) and unmask the man. The Black Hood was Mr. Svenson and, yes, he cut off his own finger and sent it to Betty. The theory is he tried to rectify his own guilt about sentencing an innocent man by exposing all the sinners in town. What a shame. At least that’s all wrapped up in a nice little bow. Jughead is not at all happy that his dad is stuck in a mess he created with Penny Peabody while FP is determined to take the brunt and keep his son out of trouble. It turns out that Jughead is actually enjoying Serpent life and takes the whole thing pretty seriously, much to FP’s surprise and a little dismay. We all know Serpent life isn’t the life he wanted for Jughead and for Jughead to embrace it with so much vigor is just not what he had in mind. Jughead is determined to find a way to fix the Penny problem, but FP points out that they have no leverage and he’s just going to keep doing what Penny wants until she decides it’s over. Jughead and FP have a big fight about the situation (and I’m sure part of it is because his dad is excluding him from other Serpent activities), but Jughead decides to take matters into his own hands. He rallies the teen Serpents into helping him out and his major talking point is that he doesn’t want the Serpents to end up like the Ghoulies: as drug runners and scum around the Southside. Jughead is also sure that there won’t be any end to Penny’s demands and she will eventually get all of them wrapped up in something bad. Jughead and the teen Serpents kidnap Penny and take her to Greendale before his dad’s scheduled pickup. Jughead says she can run her drug business but not in Riverdale. Penny taunts Jughead and calls him some names saying that the Serpents can’t hurt one of their own, to which Jughead replies that having the tattoo does not a Serpent make and he pulls a switchblade. We can only assume from the subsequent screams from Penny that Jughead removed or at least mutilated her tattoo. Getting dark there, Jug. When he later tells his dad about what he did, FP flips out, saying that she will be back and her wrath will be terrible. However, Jughead insists that he was very persuasive and she won’t be coming back. We can only wait and see. Despite the heartbreaking (for some) breakup between Archie and Veronica, the girl still has feelings for him. In a weak moment, Archie confides to Veronica the monetary hardship his family is going through: Fred just got his hospital bill and it’s a whopping $86,000! All Veronica can see when she looks around her home during dinner is excess wealth when others are struggling to make ends meet. This results in a fight with her father and some subsequent snooping through his office where she discovers the deed to Pop’s. She also uses her mother’s black American Express card to pay Fred’s hospital bill in full as her mother, but wants it kept anonymous on the other end. Of course her parents find out about the charge and she confronts them with their lie about the fact that they now own Pop’s. She wants in on Lodge Industries – especially because her name is on it – and her mother decides that it’s time to tell her everything. We don’t know what “everything” is, exactly, but we know Veronica is in on it with the rule that she’s not going to do anything illegal. Her mother offers two words to help with that: “plausible deniability.” This can only end well. Things aren’t going so well in the Blossom household. 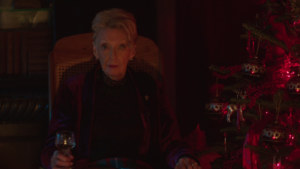 It seems the family is strapped for cash but Cheryl is determined to save Christmas. She insists on buying the best tree at the Christmas tree lot that Fred and Archie are running outside of Pop’s, but when her mother comes home to find a large and fully decorated tree, she is less than amused. Cheryl insists that her mother should look for a job, perhaps with the Lodges, but then taunts that her mother’s only skill is being a bad mother. I guess she was wrong because she came downstairs on Christmas morning to find her mother in a compromising position with a stranger on the couch. Maybe mother is failing back on the world’s oldest profession? I guess we’ll have to wait and see. 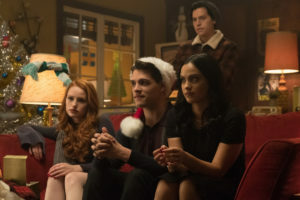 Despite being broken up, Archie and Veronica exchange gifts as do Betty and Jughead. It’s awkward and weird even though they are still trying to be friends after the fact. There’s a very heated moment in the car after talking to Nana Rose where Betty and Archie kiss!! It’s also obvious that the two are paying a little more attention to each other than before. Is something going to get started? Probably not because Veronica comes over to Archie’s house and they make up. She says “I love you” back to Archie and the whole thing seems sweet, but we can’t help wondering if there are ulterior motives at play here. Watching Kevin singing outside of Pop’s with Josie was adorable. Can he do more of that? The Serpents aren’t all bad. They give a lot back to the community and participate in programs like Toys For Tots and Meals On Wheels. Love it! I’ll admit I was wrong about the identity of the Black Hood and we can all admit the janitor Mr. Svenson was really creepy, but why didn’t Archie see it in his eyes?